Moving forward under the banner of *Roots and Shoots*, plantation of Aloe vera was done by the students of class I, II and III. Students enthusiastically participated in plantation and were very keen to know about the techniques for planting a sapling. They were taught about the preparation of soil like tilling, manuring and watering as well as the importance of following this process. Students were also detailed about the medicinal use of Aloe vera. 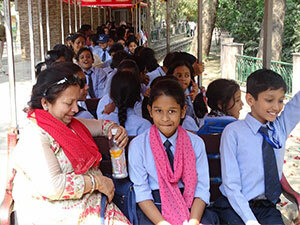 The day started with lot of joy and excitement among the primary students for the trip to the Lucknow zoo. Some of them haven’t seen zoo ever and some were waiting to see the growth of the animals from. We boarded at the bus at around 9:15 am in the morning. 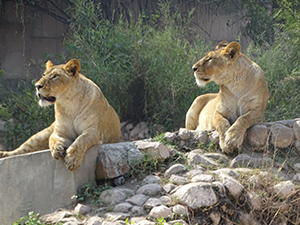 The aim of the trip was to make them aware of the wild life and the captivity of animals. We mainly did the sightseeing around the zoo, Museum visit, and train ride. After taking the tickets first we covered birds sections where students were amazed to see colorful, rarely found birds, especially white peacock, African Macon, different pheasants, toucans etc.. Later we reached to the lion enclosure and got stuck up to see the lion family basking the sun. Students saw giraffe, zebra, chimpanzee, Variety of fish, reptiles. Ostrich was also the main attraction. We saw museum where students got information of Indus Civilization, Egyptian mummy and wall murals. Depiction of the Lord Buddha’s life history. Thereafter the kids relish food in proper discipline. Finally they all had train ride. We came back our school at around 3pm. Over all it was a fun filled trip. Every child is having an in born potential and caliber to observe, weigh and calculate anything in his own calculative and imaginative manner within his capacities of mind. The emphasis should be laid upon utilizing this continuous flow of natural tendencies and make it an essential element of our nature. We should continue to strive to utilize the best available resources in order to accomplish them correctly when we grow up. As a child we go through the moment of ecstasy, over powering the anxieties and adversities around, and the same should be followed while growing uo amidst the environment of chaos, anarchy and uncertainty. Only then the real essence of life can be nurtured and cherished in the best possible manner. It is a child who later on becomes a man of wisdom out of his own experiences of life. Carrying out these noble thoughts in the mind, SRMPians organized a Footwear Decoration Activity for the students of classes Third to Eleven under the guidance of art teachers Ms Venu Rastogi and Ms. Shambhavi Garg. This activity was held on 22nd February,2017 to create trendy and innovative attitude. 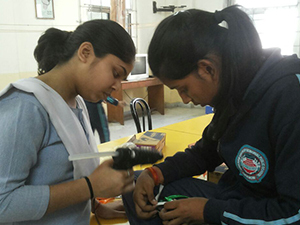 It lighted a spark among the students to do something innovative on their own. 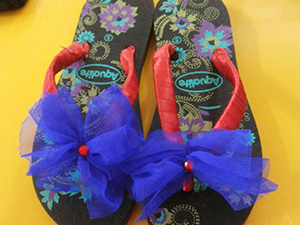 All the students participated with great zeal and enthusiasm and showed their creativity in decorating the footwear with glittering and sparkling items. The students showed their ornamental caliber and imaginative skills to make the event and extra ordinary memorabilia for the school. All the students are divided into four houses – Bhasker, Aryabhatta, Raman, and Bose. House activities are planned meticulously round the year to inculcate in the students a sense of pride for their country, healthy competitive atmosphere, team spirit and sportsmanship.